"Grandma has a new cake pan!" I can hardly wait to tell you about this new Nordic Ware Bundt Cake Pan I requested to review. 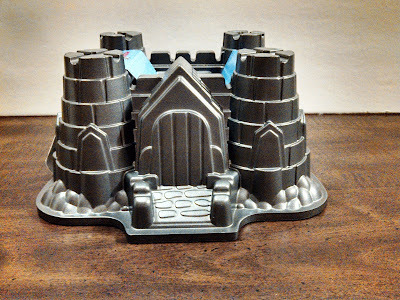 One day while looking for cake pans online I came across Chef's Corner Store and this fabulous Castle Bundt Cake Pan. I was totally excited when I saw this Castle pan. I love making cakes for my grandchildren. Can you imagine a castle cake with knights, horses, and dragons? Or How about a castle cake with princesses and fairies? My grandchildren are sure to have some very memorable birthday cakes in the near future. So now that I got my pan I wanted to use it correctly. I read the instructions that came with the pan. I also was given some very good tips from Stephanie at the Chef's Corner Store. Tips for getting a good release from your detailed bundt pan. 1. Wash you pan thoroughly with warm soapy water and dry well. 2. Coat your pan with a baking spray. The baking spray should contain flour in it. Very Important! 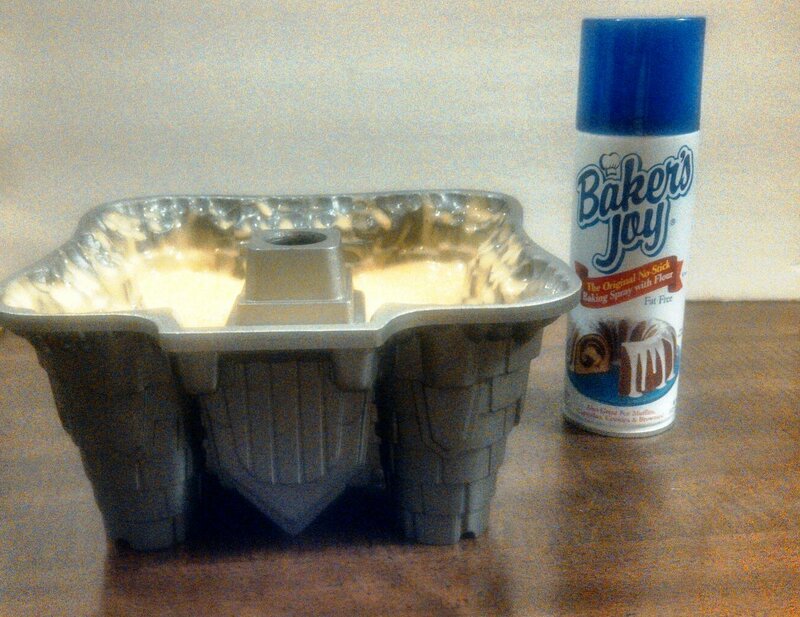 Use a pastry brush to evenly distribute the spray into every crevice. Make sure there are no globs of flour or pools of oil in the pan. 3. Fill the pan about 3/4. Roll the pan from side to side to coat the walls of the pan above the batter line. This helps the cake to rise up evenly on the sides. 4. Tap the pan on a table or counter to release any air bubbles. 5.Allow the cake to cool for 10 minutes after baking. No shorter or longer than 10 minutes. 6. Pick up the pan with hot pads. Gently shake the cake sided to side. Use a plastic spatula to release any cake sticking along the edges. 7. Invert the pan on a cooling rack or plate. Allow to finish cooling. Now, on to baking the cake. I followed the above instructions very carefully. I had a positive attitude that this was going to work. While my cake was baking I started to think about all the times the cake stuck to an ordinary cake pan. "Oh, dear! How can this cake possibly not stick to such a detailed cake pan? I have never used baking spray before. I usually use butter and flour to coat my pans. I was pretty nervous. When I took the cake out of the over I got even more nervous. Ten minutes is a long time to sit and fret about this cake. Then the ten minutes were over! Time to invert my cake. I gave it a side to side shake .Loosened one spot on the edge. Flipped the cake onto a plate and shouted with joy! The cake released with out one crumb sticking! I am so thrilled. Early that morning in anticipation of baking this cake I made a few fondant decorations to decorate the cake with. Thinking a beach sandcastle theme. I sculpted the fondant by hand and painted it with watered down food coloring. I may be doing a DIY on this technique in the near future. The sand around the base of the cake is ordinary brown sugar. I spread it around and sprinkled some on top. Follow Chef's Corner on Facebook and Twitter. Readers, What do you think about this bundt pan? What is your favorite cake flavor or decoration? Grandma Bonnie's Closet received the product mentioned above for free. Regardless, I only recommend products or services I use personally and believe will be good for my readers. You are the Cake Queen!! My goodness does that look beautiful. 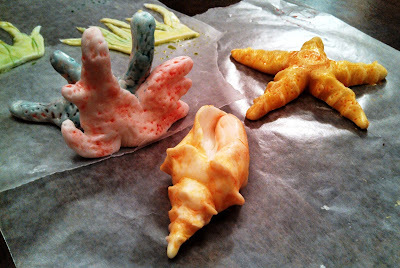 You must be very artistic to so a fondant sea shell, and the star fish too. Wow!! Beautiful! 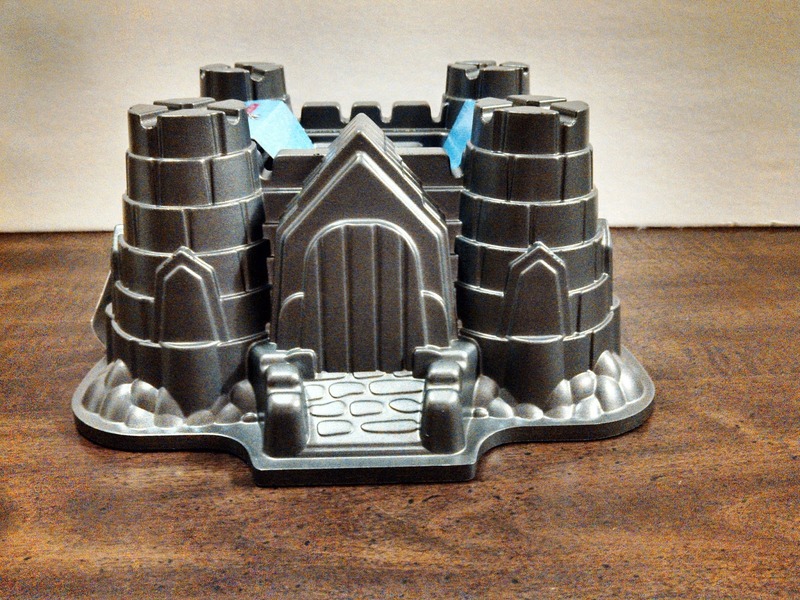 I love how detailed your cake came out from using this castle pan. 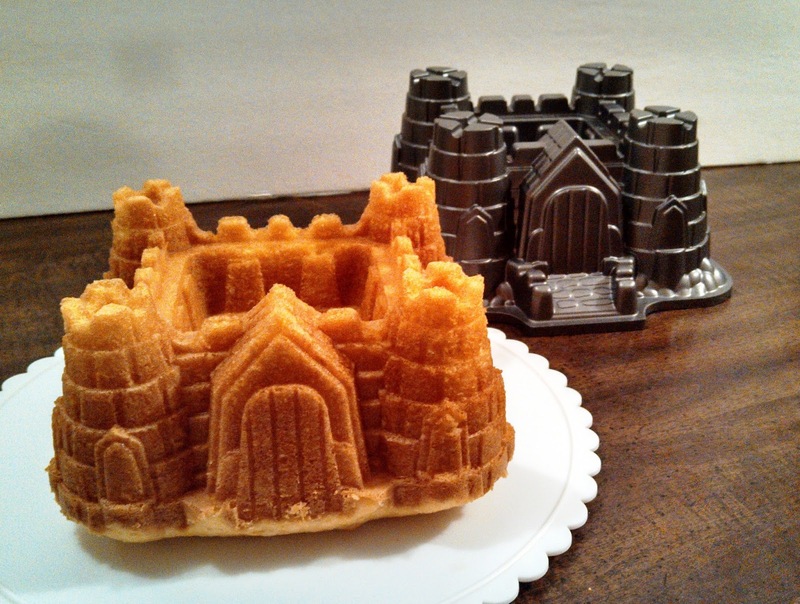 I think that even I could make a successful cake with this mold. That is awesome! You did a fabulous job. 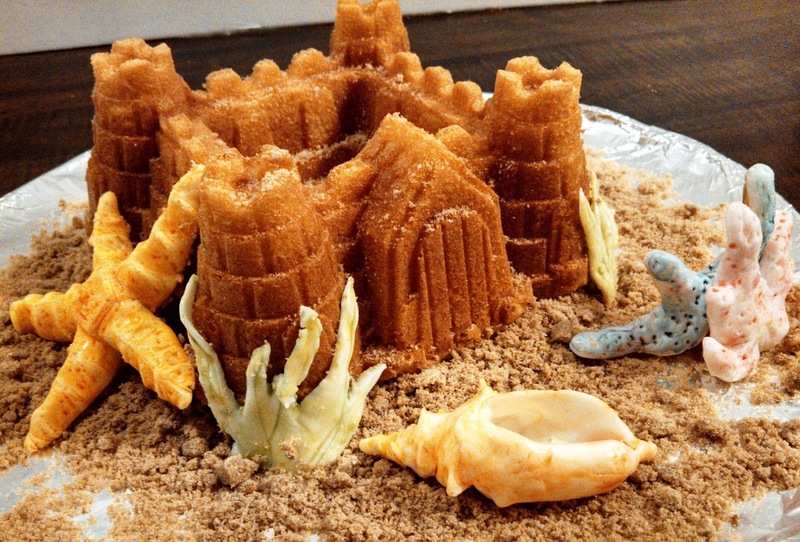 Love the sand castle theme. I have not purchased pans like this for the reason you mentioned, I figured it would stick terribly. Nice to see it come out so clean. I think I was as skeptical as you were, but holy cow! Even without decorations, that thing looks amazing! Wow, this is so beautiful! You did amazing with the fondant starfish and sea shells! I never knew, either, that your baking spray should contain flour - definitely going to have to look and make sure ours does! Thanks for the great tips! Wow! That is an awesome cake. You did a great job with the fondant starfish and sea shells. That cake pan makes it so easy and looks great even without the fondant decorations. Wow they're so cool looking moulds . LOVE it! This is great. What kid wouldn't love to have this cake for a birthday party. 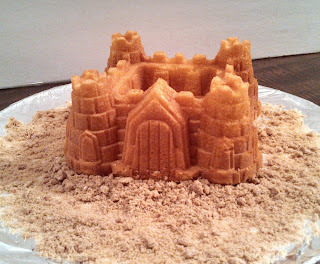 The brown sugar is sand is so creative. That is amazing! I bet this could also be turned into an adorable princess cake too. I like the beach theme though. Summer is my favorite season! I can never get my fondant decorations to turn out as nicely as yours! At first I thought that was real sand - brown sugar. How cute is all that. Oh my gosh another person that loves Noric Ware as much as I do. I LOVE their pans. I don't have this one though. I do have one that has trees and a little house it is my very favorite bundt pan. Nice decorations too! I have never used fondant before. I would love to try this one. Wilton makes so many great products. Wow, that is amazing! My son is quite a baker and he would love this! Wow--that is GREAT.. What a neat cake (cake pan)... I love it --and the brown sugar looks just like sand... Love your starfish also... The grandkids will love that one for sure. You are just SO talented. I just bought this Nordic Ware pan on ebay for $8.99 with free shipping, check ebay if you are looking for this pan.